Survivors often face social isolation which further damages their self esteem and socioeconomic status. These prevent many female acid victims from living independent lives resulting in a situation of vulnerability and dependency. In this scenario, women’s potential remains unrealized and their contribution that could be directed to the betterment of society is underutilized. 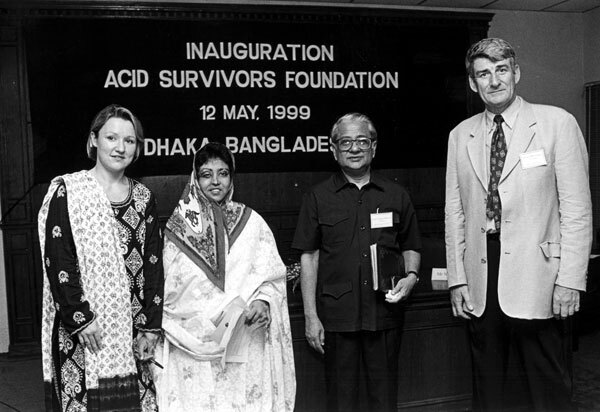 ASF was formed with a vision to reduce and eventually eliminate acid attacks in Bangladesh and ensure that acid survivors are able to live with dignity. Since its formation, ASF has emerged as a global pioneer in combating gender-based violence in the form of acid attacks. ASF has been working towards this vision by providing holistic burn care services. ASF runs a 20-bed hospital fully equipped to provide standard burn care services including plastic and reconstructive surgery in a low resource set up. ASF’s hospital provides comprehensive services including psychological care, legal assistance and financial support for economic rehabilitation. ASF engages government and civil society to take an active role to ensure that survivor’s rights are met by advocating at the national level for policy changes and at the local level to bring about changes in process and practice. ASF runs national and local prevention campaigns to raise awareness on the legal and social consequences of acid attacks and disseminate relevant information on what to do and where to go for help if an attack occurs. The declining trend of acid violence shows the level of success that ASF has achieved since 1999. ASF’s rights based campaign has led to many unprecedented institutional and policy reforms with specific results including deterrent punishment against attackers. ASF’s prevention campaign has significantly reduced the number of acid attacks over the years. ASF started its prevention campaigns in 2002, the year 2002 saw the highest number of attacks with 496 recorded attacks. However, the trend started to decline from 2002 and in 2014 there was 58 number of incidents affecting 72 victims. Although the number of attacks has declined since 2002, acid attacks still remain a grave concern and the challenge is to sustain the downward trend and eliminate this form of violence in Bangladesh. In 2011 an expert team from Management Development Foundation (MDF) worked with ASF to develop a ten-year strategic plan and a five-year project proposal. The process was highly participatory and involved representation from all levels of ASF. The objective of the planning process was to clarify the future direction of ASF, to improve its effectiveness and corporation with ASF’s partners and to articulate a logical program intervention for the next five years. The ten-year vision that was identified in the strategic plan is “ASF is a center of excellence with a vision of Bangladesh free from acid violence, where burn victims, especially women and children, live with dignity”. In the coming years, ASF will continue to work towards this vision. In 2011 ASF’s Executive Director Monira Rahman was honored with the prestigious WORLD CHILDREN PRIZE in recognition for her fearless struggle for those mainly girls who have been the victims of acid attacks or petrol attacks and whose appearances have been destroyed. ASF was also honored with the 2011 Human Rights Prize of the French Republic. “To prevent acid & burn violence and empower survivors, especially women and children, by working with an integrated approach; using a replicable holistic (bio-psycho-social) model which engages all national & international stakeholders and is backed by research, experience & evidence”. “ASF is a center of excellence with a vision of Bangladesh free from acid violence, where burn victims, especially women and children, live with dignity”. We strive to ensure Survivors Satisfaction in all activities; while maintaining Confidentiality and Respect for the Individuals. We take pride in the delivery of Quality Products & Services in a Timely Manner with Accuracy and Follow Up in all we do, ensuring Safety & Security. We will continuously Build our Team for 6Excellence in Service Delivery, Accountability & Transparency.